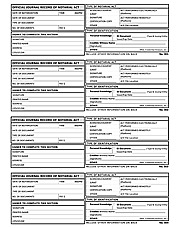 Record your notarial acts ensuring complete privacy for your customers using the Privacy Protected Notary Journal. Each entry can be concealed from viewers using the perforated records page. This easy to use journal is chronologically numbered and has alternating colored pages to maintain accurate records. This journal was designed in consultation with the Notary & Certifications staff of Montana Secretary of State's office. Proper use of this journal meets all the requirements set forth in MCA §1-5-618(3). 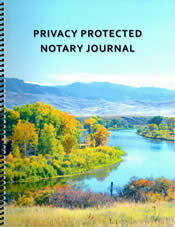 Your purchase of a Privacy Protected Notary Journal supports the mission of the Montana Land Title Association Foundation. 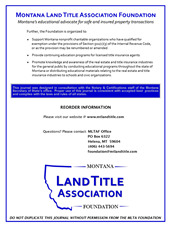 The foundation is organized to support Montana nonprofit charitable organizations, provide continuing education programs to licensed title insurance agents and promote knowledge and awareness of the real estate and title insurance industries to the general public.